Sleep in luxury and add an attractive addition to your bedding with this Laura Ashley quilted square pillow. 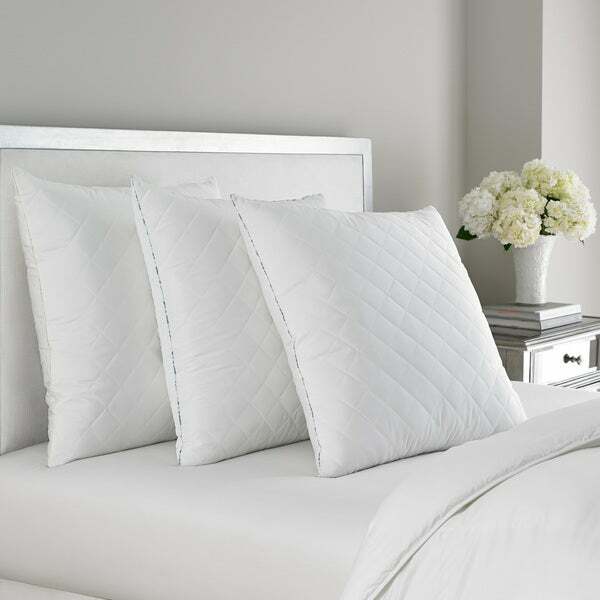 Made with white, 230 thread count quilted polyester and hypoallergenic polyester fill, this comfy Euro pillow is completely machine washable for easy care. I like to read and watch TV in bed, and also need to be sure that my head and neck are well-supported. A euro sham with a super-firm pillow insert accomplishes this, and the Laura Ashley Euro Pillow is the best I have found. Many pillows start out firm, then get "mushy" and break down with use. This pillow really holds up well with repeated use. It fits my matelasse 26' x 26' euro shams nicely; they look full, but not over-stuffed or strained. I highly recommend these pillows, if you are looking for something that starts firm and remains firm. You may pay a little more, but the quality is worth it. These are exactly what I wanted - firm prop-up pillows and decorative enhancements to my bed. I wanted a firm pillow to be able to sit up in bed and read with great support. I got it! These pillows are perfect. I was able to choose the firmness I wanted. Packaged very well. Exactly as expected. They are perfect. Would highly recommend. Don't spend the farm on a wedge pillow, when you can get a more flexible European pillow. I guarantee you it will allow you to sleep in an elevated position much more comfortably. I can't promise it will make you want to sleep more, but I can promise you will appreciate the many options you have when you do crawl into bed. As expected, his Laura Ashley pillow is beautifully made and very comfortable. So comfortable that my teenagers keep stealing it to lounge on. I think I'll have to be getting another one! 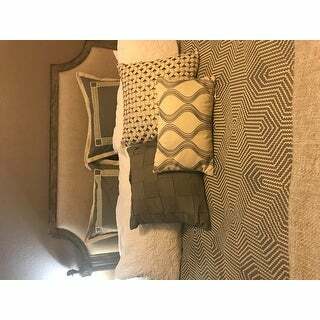 These are the perfect level of firmness if you’re looking for a great decor pillow to fill a sham! Pillows were not vacuum sealed either which is nice!! LOVE IT! I compare with other similar product before I buy. I just need one not soft, not too hard. This one is perfect. It fits my BIG SQUARE CASE. It doesn't smell. Great product! Nice pillows for the price. I use them strictly as decor with the shams of my comforter collection, so I can't tell you how they function as pillows you use for any other reason. I'd buy them again. These are exactly what we needed. The extra firm pillows and some new shams updated our old couch that had become saggy and drab. The pillows provide the support of a new couch. I love these pillows! They held their shape and I had them for a year now! Great quality! I bought 4 of them. Beautiful pillow and the shams are included. Great deal!! Don’t let the price fool you as the quality is top notch. Had for over 6-months with regular use and they have kept their shape. Much lower price than similar items I found with the same qualit! Good price discounts and firmness of materials.